Application:Bunded Oil Spill Recovery Trailer for recovering oily contaminated water in pits, sumps, drains, ponds and dams. Heavy duty, robust, industrial trailer, 7 x 4, with extended drawbar and off road jockey wheel. Hot dip galvanised chassis with marine grade aluminium tray for maximum corrosion resistance in arduous mining or marine environments. Heavy duty, new off road tyres and Sunraysia rims - landcruiser stud pattern. Matching spare wheel and tyre. Fully welded and sealed extra deep tray with a non displaced storage volume of 1000 litres. 800 litre polyethylene storage/cartage tank. Petrol driven self priming 70 l/min diaphragm pump. Dual function system - simply use the changeover valves to allow pump out from the sump into the tank and, when full, pump from the tank to a bulk storage facility. 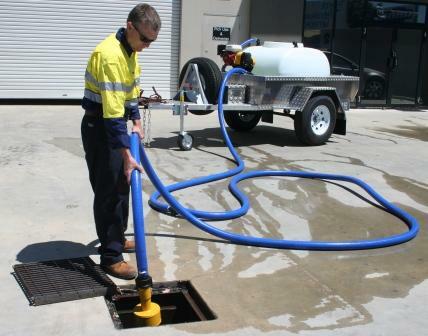 1 x 10m and 1 x 5m reinforced hose kit with quick release camlock adaptors that allow pumping flexibility. Special purpose suction strainer for low level pump down and crevice tool for hard to reach places. Diesel driven or air operated pump. Higher (or lower) volume pump. Larger (or smaller) storage tank. Larger trailer with bigger bund capacity. Additional equipment such as skimmers, containment booms, spill kits, etc.